Last week marked our five-month anniversary of arriving in Melbourne - and it has been two months since we moved into Hamby Home(in)stead. There have been many happy happenings during that time. Not least was the sight (the day after our anniversary) of a perfect double rainbow arched over "our" paddocks! 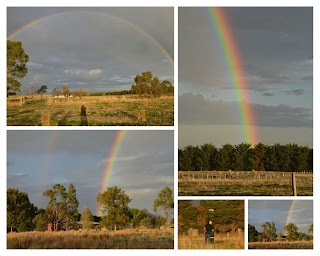 And when I stayed in the right spot, it seemed both rainbows ended just at our house. How magic is that?! I received your newsletter in today's mail and chuckled heartily as I read about what's news for ewes. I'm so happy for you and the family. It seems that this time you've found Valhalla. I certainly hope so cos you sound so blissfully happy. I can't believe that Vaughan is in year 2! Where have those years gone?? Thanks, Lynne - our world is certainly never boring but is significantly brighter/happier since moving South! The Young Master's 8 years have definitely sped along (though so have Miss Nissa's 18 and Miss Erin's soon-to-be 21) - we just we won't mention mine! !